Hope you’re having a wonderful start to your week! 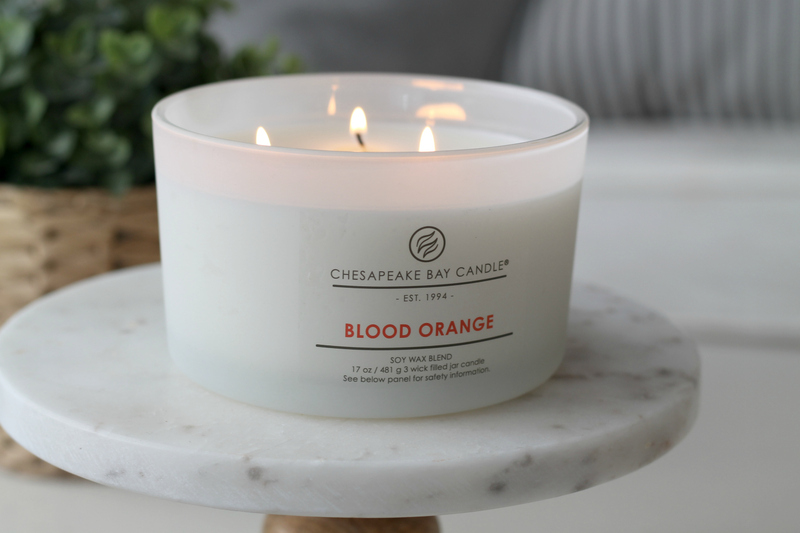 I am really excited about today’s post because I’m sharing some of my absolute favorite candles for the home from Chesapeake Bay Candle! 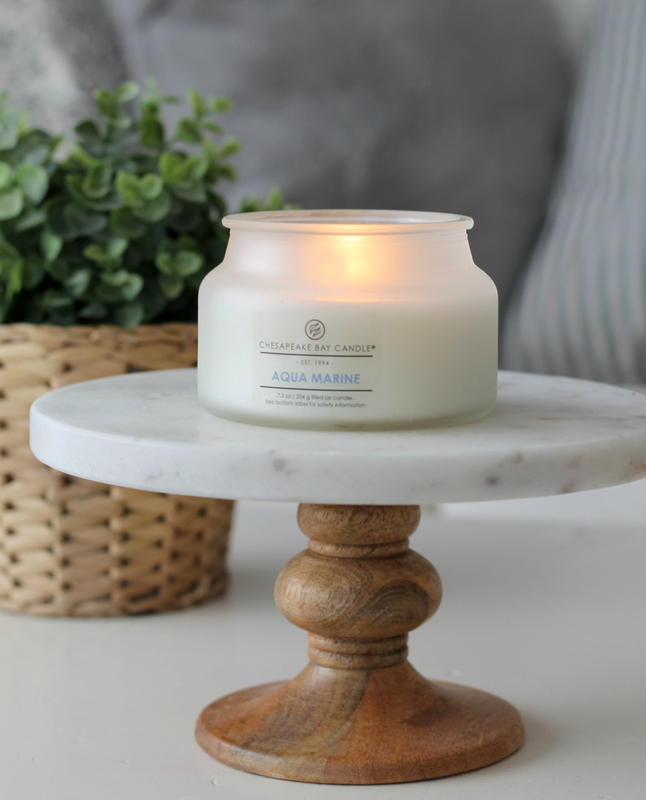 My favorites are from the Heritage Collection that draws inspiration from the simple, clean, basic lines of the Chesapeake Bay Candle with a new modern and updated look and feel. I absolutely love having candles in our home, they bring an element of fragrance and warmth that just can’t be beat. 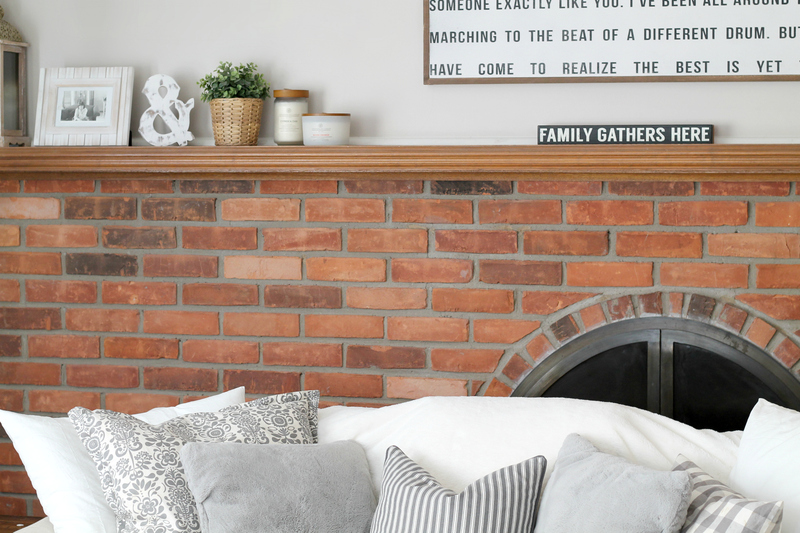 The Heritage Collection from Chesapeake Bay Candle has such rustic charm, that fits in perfectly with our farmhouse-style decor. All of the fragrances are inspired by the local fruit and botanicals, and let me tell you – they smell incredible! 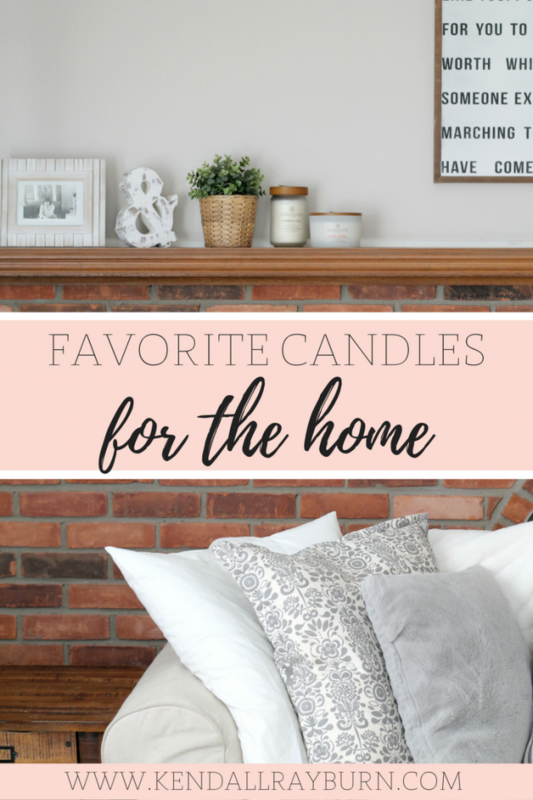 I can’t wait for you to read about these amazing candles, and get a chance to win some, too! Each gorgeous candle creation contains natural essential oils and is based around a solo (or duo) ingredient bringing a scent that has many layers and is just all-around unique. The packaging was carefully selected to be natural with minimal design to fit with any decor. The galvanized tin candles are my favorite because they’re rustic / industrial and just look cool! 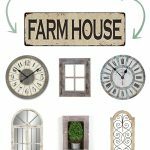 I’ll list my favorites and their prices and a bit about each below! So keep reading to check them out! 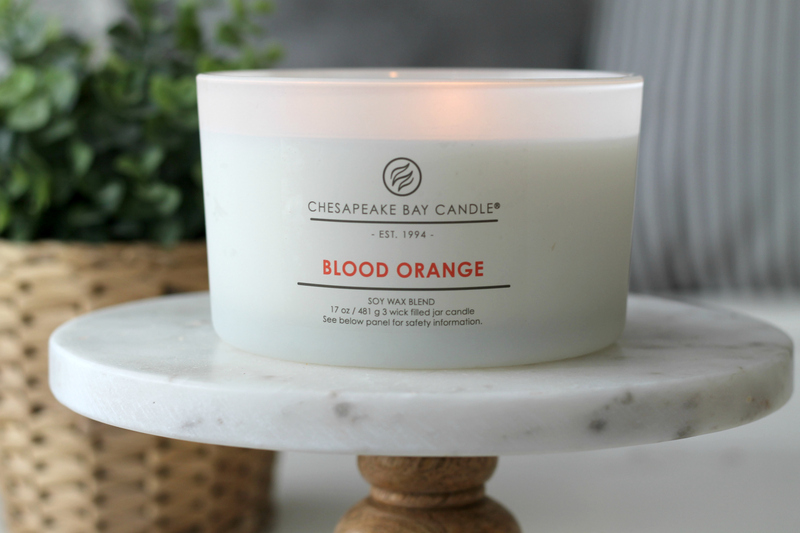 The scent of this Blood Orange Candle is just magnificent. 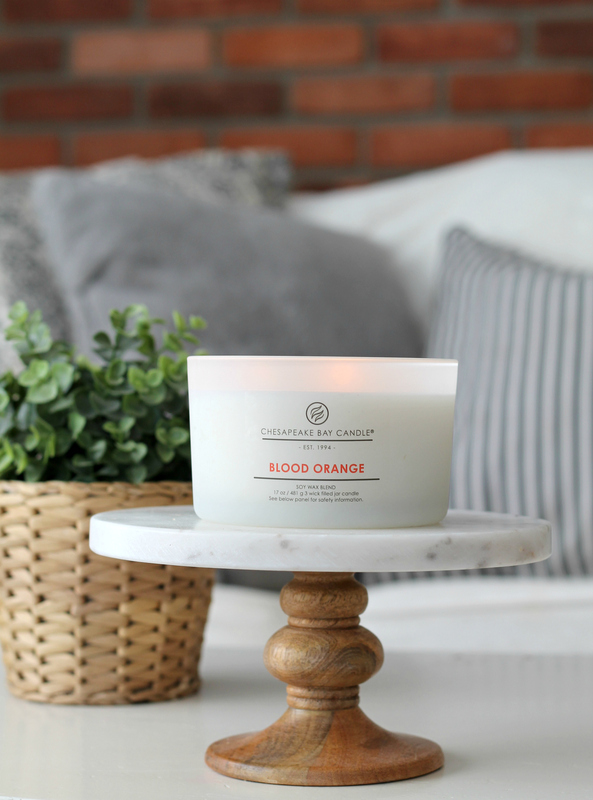 It’s a soy candle that’s designed and poured in the USA and it has an energizing citrus scent that is just warm and inviting. 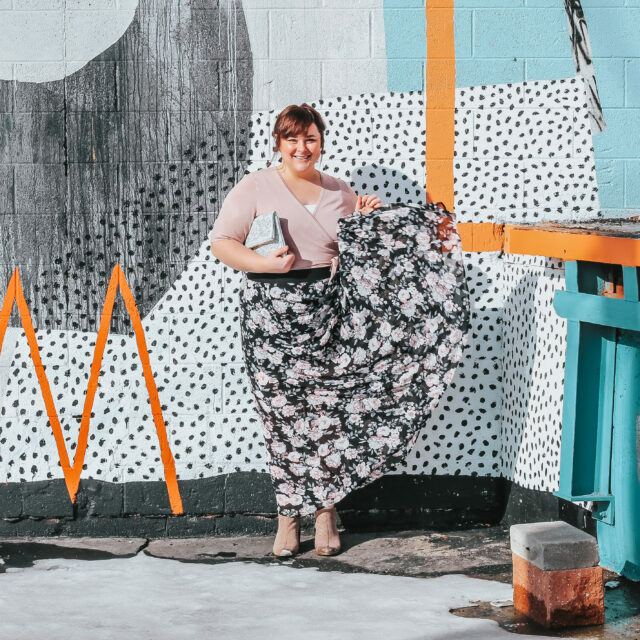 It’s scented with natural elements of mandarin and blood orange, passion flower, melon, and mango, and also contains a bit of earthy cedar wood, sultry honey, and just a hint of pepper. I love the 3 wick design because it really ensures that the fragrance diffusion will be enough for a large area like a living room. 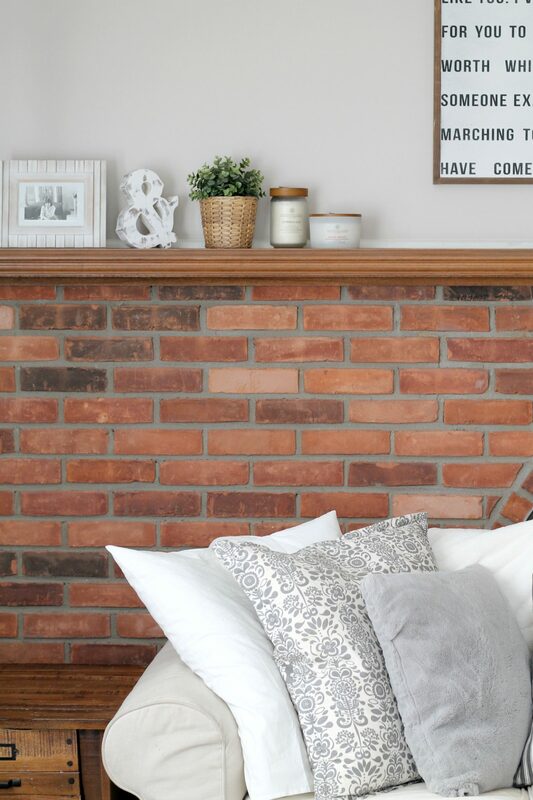 It’s the perfect coffee table candle – and it can burn for up to 34 hours! This soy blend candle is also designed and poured in the USA. And the fragrance has notes of ancient evergreen and cypress trees. 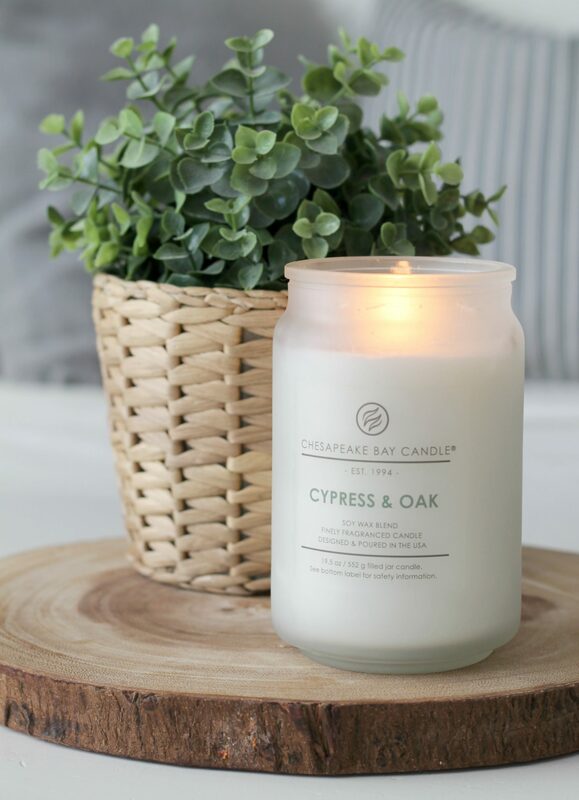 It also has an inviting spearmint, eucalyptus, woody balsam, oak, and lavender for a well-rounded warm woodsy scent. It’s in a gorgeous frosted clear glass jar and has a wooden lid. 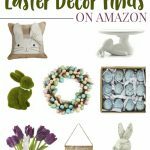 This bad boy will burn for 80 hours, and I love to put these on the mantle along with a smaller jar candle like the Aqua Marine Small Jar Candle that is up next! 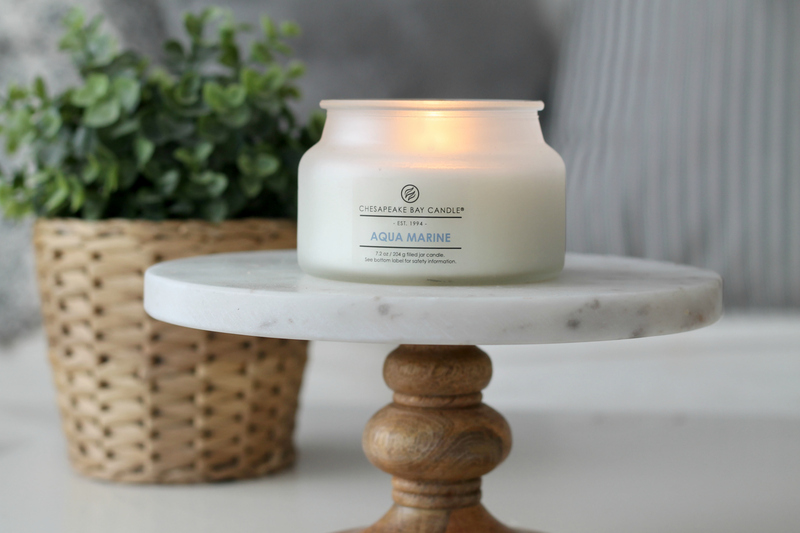 I just love the fresh scent of this soy blend candle (also designed and poured in the USA). It’s fragrance reminds me of the ocean, it’s got bergamot, lemon zest, marine accord, and pineapple. There are also notes of lily, lotus, and seagrass that really complement the musk and sandalwood that is also included. This candle is warm, relaxing, and packaged in a beautiful frosted glass jar with a burn time of 20 hours. 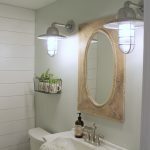 I love these smaller candles for the mantel, or bathroom! I’m not trying to pick favorites or anything, but this galvanized packaging is like a dream come true. 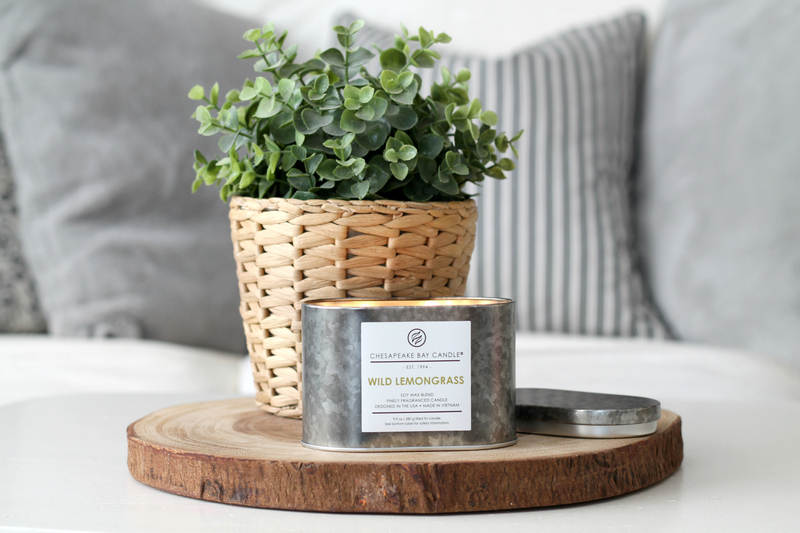 I absolutely adore this soy blend candle (designed in the USA, poured in Vietnam). The scent is so vibrant and happy and it’s just so fresh! The fragrance contains sparkling verbena, lavender, garden mint, wild lemongrass, eucalyptus, citrus, thyme, and coriander. There are so many layers of scent to this candle and they all blend together beautifully when it’s lit. I love having this candle bedside in the bedroom, it’s so relaxing to have next to the bed while reading and sipping a cup of tea. 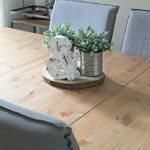 The burn time on this is 20 hours, and the galvanized tin is such an industrial and chic touch! 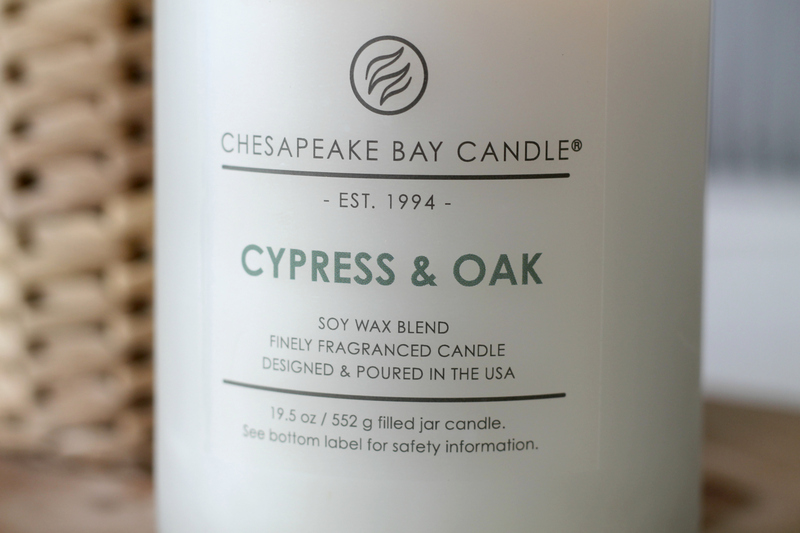 But, don’t worry – our friends at Chesapeake Bay Candle want you to experience these amazing scents, too! So we’re teaming up for a fun giveaway so you can have a chance to win some goodies, too! Just enter via the Rafflecopter below, best of luck! Which of these scents would YOU love to try?